On Constitution Day, September 17, the United States commemorates the drafting of its Constitution. Broaden your knowledge of — and appreciation for — this historic and important document through a brief exploration of the following information and links. Students, you have access to the NY Times. - Click on "Log in here"
- You will now be able to access the digital NY Times from on- or off-campus. - You must be on campus. 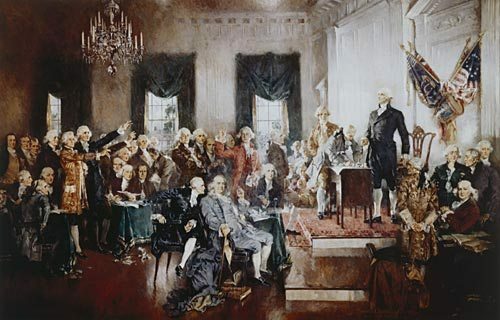 The Constitutional Convention met at the State House in Philadelphia, PA. There were 55 delegates to the Convention. Twelve of the thirteen states were represented; Rhode Island did not send delegates to the Convention. The Constitution was drafted in 1787 and became law on June 21, 1788, after 2/3 of the states ratified it. James Madison is often called the "Father of the Constitution." Not all the states had ratified the Constitution by April 30, 1789, when George Washington became the first President of the United States. The structure of the document has not changed since it was written. Amendments have provided the flexibility necessary to meet changing circumstances. The Constitution is preserved for all to view at the National Archives in Washington, DC. Check out a selection of books (and a few videos) about the Constitution that are available at the Mikkelsen Library. Test your knowledge with these interactive quizzes — American Bar Association, ConstitutionFacts.com, and Intercollegiate Studies Institute. Learn other facts at The Constitution of the United States: Questions and Answers. Interactive Constitution — Want to know how the Constitution relates to any one of about 300 issues, from abortion to school prayer? The National Constitution Center presents this interactive site, which allows users to search by keyword, browse by keyword topics and search the text of the Constitution by Supreme Court cases. Justice Learning, by the Annenberg Classroom — The Constitution Guide investigates the meaning of each article of the Constitution in a “What it Says” and “What it Means” format. An extensive interactive timeline of the ratification process is included. Library of Congress: The Constitution — Link to articles on Constitutional Interpretation, Executive Privilege, Military Tribunals, National Security and other constitutional issues in this Library of Congress guide. Additionally, the personal papers of Thomas Jefferson, James Madison and George Washington are part of the Library of Congress’s extensive Primary Documents in American History collection and provide a unique insight into the formation of the nation and the Constitution. National Constitution Center’s Constitution Day resources — “The National Constitution Center is an independent, non-partisan, and non-profit organization dedicated to increasing public understanding of, and appreciation for, the Constitution, its history, and its contemporary relevance.” This site compiles numerous interactive quizzes and various other resources on the Constitution. National Archives' Constitution resources — Download a facsimile of the Constitution or read a transcript on the National Archives website. As the repository of the original Constitution, the National Archives maintains an extensive website of Constitution trivia, facts and an in-depth look at the Constitutional Convention and the ratification process. Interested in learning about the men in the below oil painting? Thirty-nine men, most of whom you've probably never heard of, have had an enormous impact on your life. Who were they? Read the bios of the signers of the Constitution on the National Archives website. The Scene at the Signing of the Constitution, oil painting by Howard Chandler Christy, 1940.